Vehicle Capabilities are attributes that give vehicles special capabilities. Raging Tiger introduces a number of new and highly versatile Vehicle Capabilities. The first, and perhaps most powerful capability that Raging Tiger adds is the 'Vehicle Carrier' attribute. The name 'Vehicle Carrier' is a bit of a misnomer. Vehicle Carrier vehicles are actually vehicles that can carry personnel, other vehicles, or both. This capability can be used to simulate everything from a UH-60L Blackhawk to a US Navy LCAC (Landing Craft, Air-Cushioned). It can also coexist happily with the 'Personnel Carrier' capability. Deciding whether to use the 'Vehicle Carrier' capability, 'Personnel Carrier' capability, or both can be confusing. Here is a brief table that might help. Vehicle carries vehicles and personnel in the same compartment. Yes. Set 'Personnel Restriction' to 'No Restriction'. No. No. Vehicle carries only vehicles Yes. Set 'Personnel Restriction' to 'No Restriction'. No. No. Vehicle carriers only personnel No. Yes. 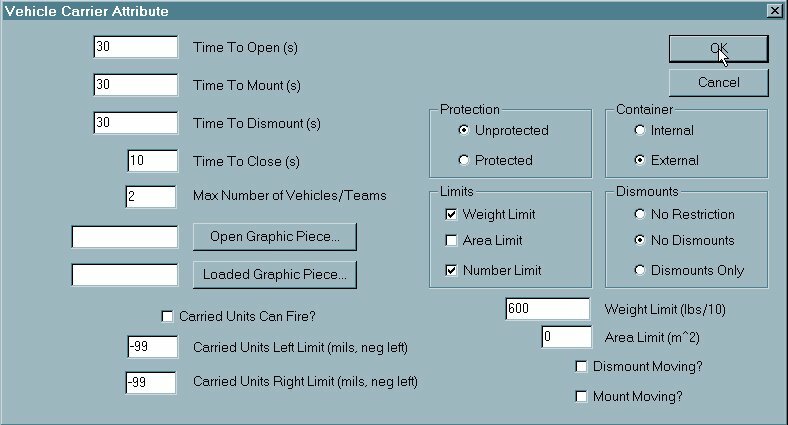 However, if you want special capabilities such as a 'Loaded Graphic' or area limit, use 'Vehicle Carrier' capability with 'Personnel Only' set. No. Here, we assume that you have already created or opened a vehicle for editing. For instructions on how to do this, see Create a new vehicle from the ATF Power Toolkit tutorial. The steps are the same in the Raging Tiger Power Toolkit. These steps begin once the 'Vehicle Edit' dialog has been opened and the vehicle is ready for editing. 1. We are editing the UH-60L Blackhawk from the Armored Task Force database. The 'Personnel Carrier' attribute already describes the carrying of personnel inside the aircraft. We are going to add a 'Vehicle Carrier' attribute that describes the slingloading of vehicles and equipment outside the aircraft. Select 'Add' next to the 'Special Attributes' window. 2. Select 'Vehicle Carrier' and 'OK'. Loaded Graphic. This is the vehicle graphic displayed for the vehicle when it is loaded. Carried Units Can Fire, Left and Right Limits. If checked, units carried by this carrier can fire. The values in the Right and Left limits are the angles in mils from the front of the aircraft (left of forward is negative, -99 means ignore the entry) that carried units can fire. Protection. This is the amount of protection the vehicle provides to carried units. Unprotected units receive separate rolls for damage from indirect fire that hits the carrier. Container. Describes how vehicles/teams are carried. External units increase the size of the carrier and receive separate rolls for damage from direct fire when the carrier is hit. Internally carried units do not. Limits. Weight Limit means use the maximum weight value specified. Area Limit means use the maximum area limit specified. Number Limit means use the 'Max Number of Vehicles/Teams' value specified. Dismounts. Describes whether or not this vehicle can carry personnel or not. Dismount/Mount Moving. If checked, the carrier does not have to stop to do the specified action. This might be used for SPIES extraction via helicopter or for air drops of personnel and equipment from aircraft such as C-130's.